‘…the blessed Spring and sunshine and light and life are coming back… How I have longed for light during these dark December days!’ Elgar wrote to his friend Antonio de Navarro on 20th December 1914, after nearly five months of war. The outbreak of the Great War caused Elgar much anguish and depression and the music composed during these years reflects his sorrow and deep patriotism. Apart from Elgar’s early Sursum Corda Op. 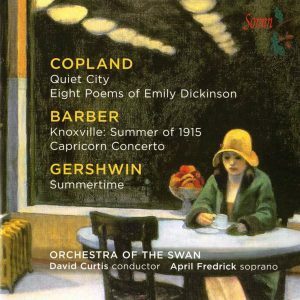 11 for strings, brass and organ (composed in 1894) this disc takes us on a musical journey from shortly before the war began to the composer’s last wartime orchestral work, The Sanguine Fan, a shaft of light during the darkest days of the war in 1917, before the dispirited Elgar retreated to live for much of the time in the Sussex countryside. 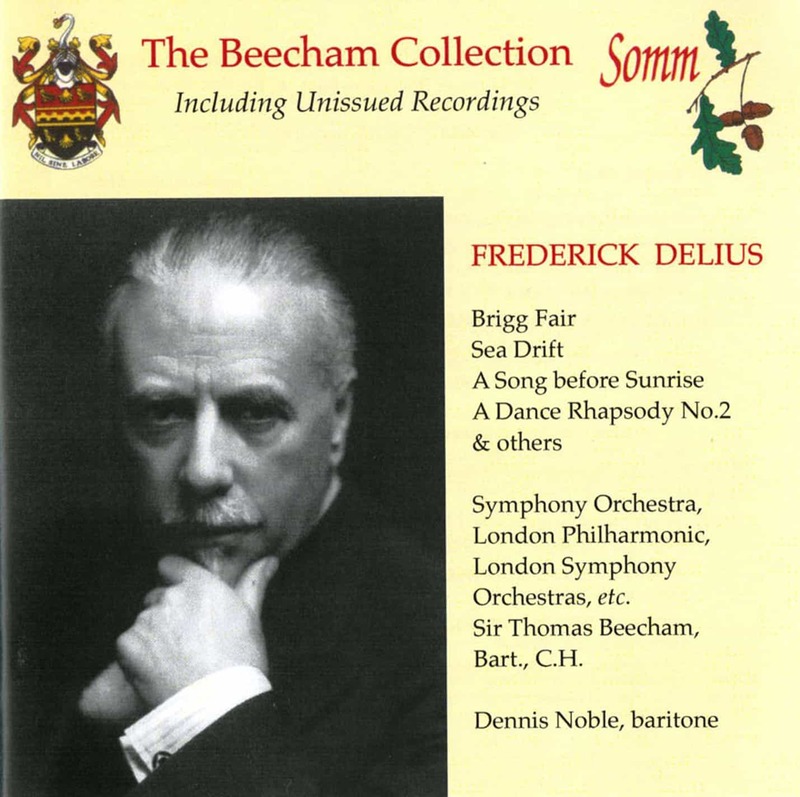 Elgar’s Sospiri, composed just before the war and described by Alice Elgar as ‘lovely like a breath of peace on a perturbed world’ is an intense, introspective adagio for string orchestra with ad lib harp or piano, harmonium or organ (harp and organ are included in this recording) dedicated by Elgar to his friend, the violinist W.H. “Billy” Reed. The charming Carissima for small orchestra, a piece re-worked by Elgar from his sketchbooks , is from the last months of peace in 1913. Elgar premiered it in HMV’s recording studio and it became his first gramophone record, issued in advance of the first public performance. When war was declared in August 1914, the innocent optimism of those who thought the war would be over by Christmas gave way to harsh reality when Belgium succumbed to the German advance. Outrage for the plight of Belgium and the intense wave of patriotism which swept over Britain were captured in Elgar’s first major war work, his powerful, thrusting Carillon. The title suggests the ruined bell towers of Belgium and the words set by Elgar for speaker and orchestra were by the Belgian poet Emile Cammaerts whose wife Tita Brand translated the words from the French into English, and was the narrator in the first performance. Written in November 1914 and premiered the following month, it was an immense success, truly capturing the mood of the moment. In turn, the success of Carillon inspired the Polish conductor Emil Młynarski to ask Elgar to compose a similar work for Poland. Elgar’s response was the colourful, jubilant Polonia, a symphonic prelude written in 1915 and dedicated to the pianist-composer Paderewski. 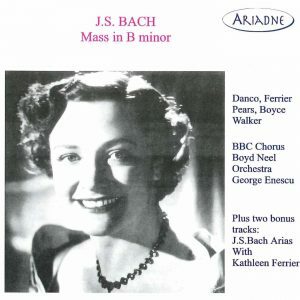 Lavishly scored for a large orchestra, it has martial vigour as well as poetry in a heady mix of original Elgar and Polish airs and quotations from the music of Chopin and Paderewski. It received its first performance at a concert in support of the ‘Polish Victims’ Relief Fund Concert’ of Polish music held in the Queen’s Hall on 6 July 1915. 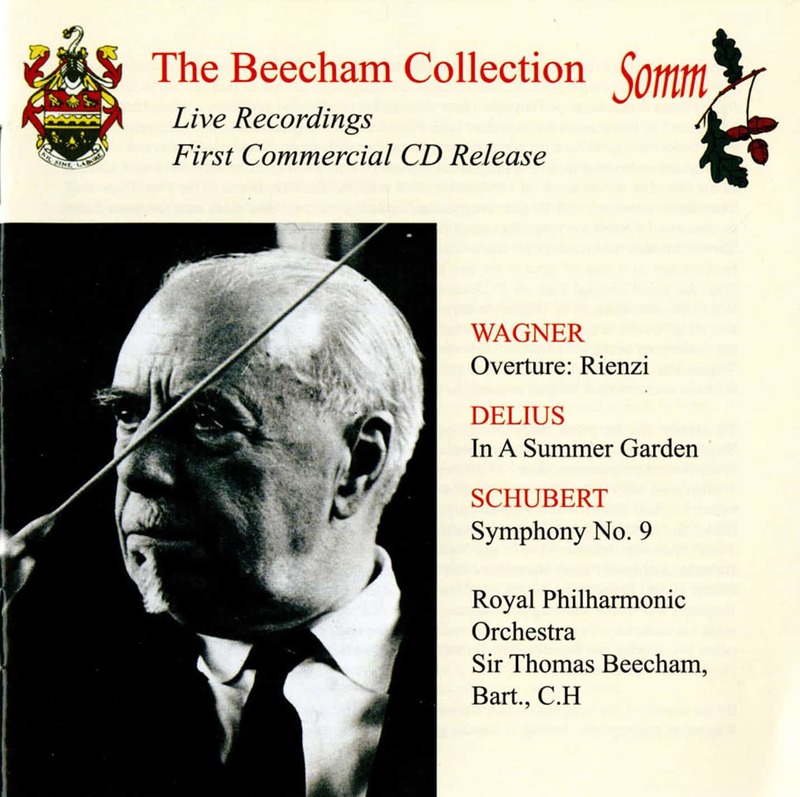 Elgar conducted its premiere, with the rest of the concert conducted by Sir Thomas Beecham. In 1915, Elgar turned to a piano piece composed in 1882 entitled Douce pensée that he had based on an earlier work for piano trio. Now orchestrated with an introduction over four bars the revised work was renamed Rosemary (in Ophelia’s words to Laertes: ‘Rosemary; ‘That’s for remembrance’) thereby becoming a work of and for its time. The second work for Orchestra and speaker to words by Cammaerts was Une Voix dans le Désert begun immediately after Polonia and finished in July 1915. 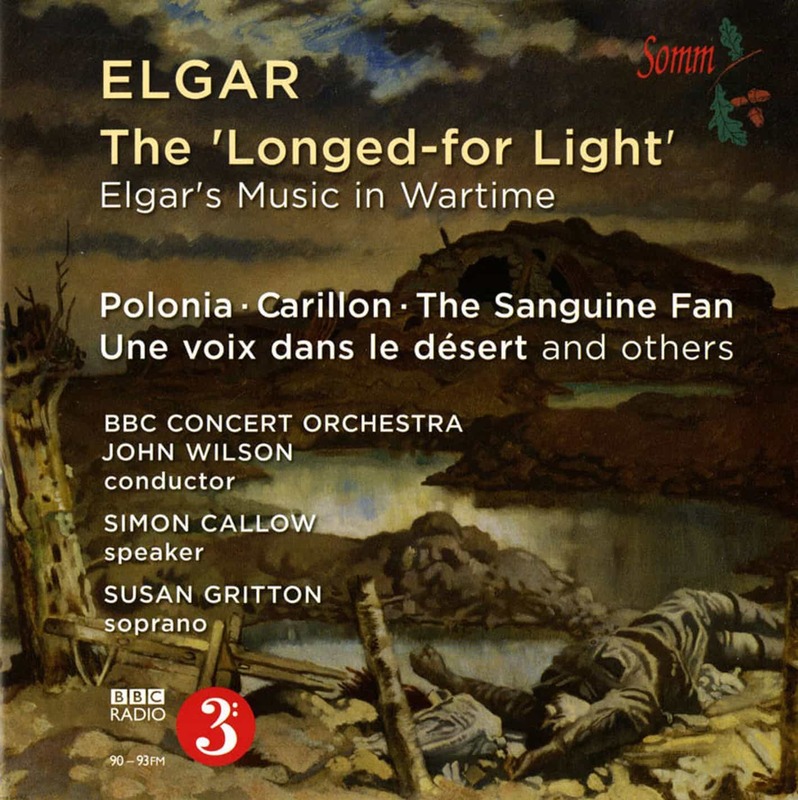 This is the most moving and desolate of Elgar’s three works for speaker and orchestra, the mood of utter devastation captured beautifully in this recording in Simon Callow’s narration: Soldiers trudge through the bleak landscape of Flanders. A flight of crows – the only sign of life – emphasises the destruction as does the ruined cottage from which an innocent girl’s voice (sung by soprano Susan Gritton), emerges singing of the hope of spring. The soldiers stop and listen before they resume their march. Composed in 1916, the third Cammaerts setting, Le Drapeau Belge did not attract the same popularity as the other two. It is a call to arms with Elgar’s rousing, martial music but it didn’t recapture the success of Carillon. The war events had now moved away from Belgium to the horrors of the Somme and Verdun. There was no immediate performance but it was performed in April 1917, in a birthday concert for the Belgian King Albert. The Fringes of the Fleet (available on SOMMCD 243) was one of the last of Elgar’s war works but this, along with most of Elgar’s music of the time was largely forgotten in the years that followed the end of the Great War. The inspirational message behind most of Elgar’s War Music, filled as it is with courage and hope, can hardly be ignored in our troubled times. This music above all, reminds us of the true genius of Elgar, the supreme Musicmaker.